Farmers Stage Massive Tractor Protest In Paris : The Two-Way More than 4,000 French farmers took to the streets over falling food prices. The protests are a fallout of EU's agricultural struggle to stay competitive globally. Upset over falling prices on their goods, angry farmers park their tractors as they protest in Paris on Thursday. 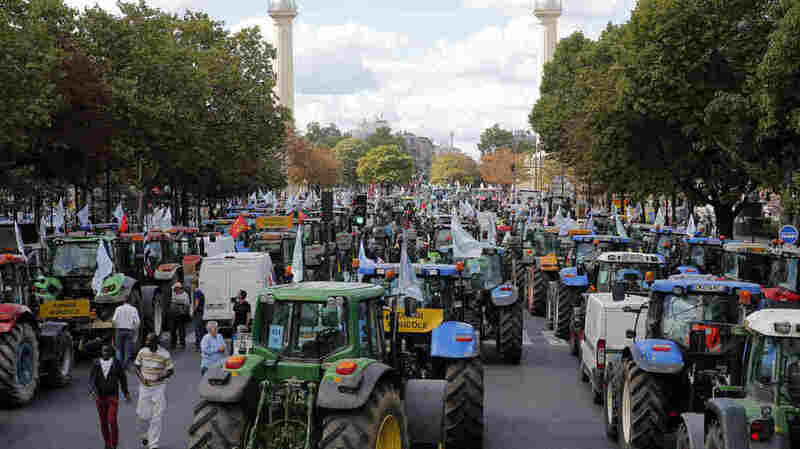 More than 1,500 tractors driven by angry farmers snarled Paris traffic this morning, NPR's Eleanor Beardsley reports. In an ongoing protest movement, farmers across the country have been up in arms about high taxes and low prices on their goods. "They're facing increasingly slim margins they blame on cheap imports and high payroll charges, which they say make them unable to compete against producers in Germany and Eastern Europe. The farmers are seeking tax breaks from the French government and EU action." In addition, a drop in prices, higher taxes, stricter environmental protection regulation and Russia's embargo on Western food products are all threatening France's competitiveness. Dairy farm owner Andie Le Mellionnec, 59, tells AP that his problem "is not whether France is a competitor or not. My problem is simply to live — meaning to feed my family, my kids." France's largest farming union and protest organizer FNSEA, says 1,733 tractors showed up for the today's demonstration, while Reuters put the tractor number at 1,580 and the number of farmers at 4,500. "Their demonstrations are part of a larger debate over how to keep European farming globally competitive," the AP reported. "A pan-European protest is expected Monday in Brussels during a meeting of EU agriculture ministers." "The plan included a rise in government support for investment, co-funded by the European Union and French regions, to bring it to 3 billion euros ($3.3 billion) over three years. "The government will also freeze the adoption of new, mostly environmental standards, allow livestock farmers to postpone all debt repayments due in 2015, and will reduce their tax bills." Earlier this summer, Beardsley reported meat and dairy farmers protested cheap imports. The demonstrators blocked tourist destinations and other major roadways with tractors and trucks, demanding higher prices for their products. Thousands of farmers participated in a similar anti-tax protest in 2013, Beardsley said on our Newscast. "France will call for a rise in the minimum price for milk, export incentives and a lifting of Russia's embargo on pork imposed last year after an outbreak of African swine fever in the east of the EU, Valls said."